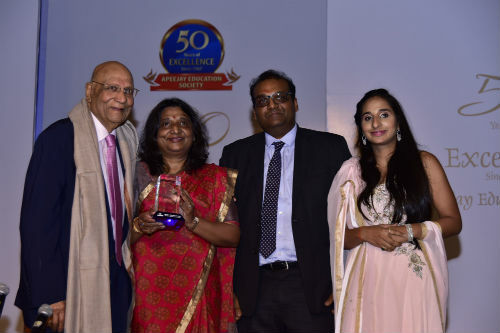 New Delhi: Apeejay Education Society (AES) – a social commitment of the Apeejay Stya & Svran Group –heralded the celebration of its Golden Jubilee year with a grand cultural extravaganza. The Chief Guest was NRI industrialist Lord Swraj Paul, Baron Paul of Marylebone. It was presided over by Mrs. Sushma Paul Berlia, Chairman, Apeejay Education Society and President, Apeejay Stya & Svran Group. The ceremony was enriched with a series of spellbinding and scintillating creative expressions by about 100 young artists, who were all Apeejayites. The guests at the event enjoyed and appreciated enthralling cultural programmes such as Kathak performance, Ghazal recitation, percussion and non-percussion music performance and Sufi song recitation. The AES, which has built a rich heritage of quality education through a family of 24 not-for-profit educational institutions, including the Apeejay Stya University, had its foundation stone laid five decades ago in Jalandhar, Punjab. All Apeejay Stya educational institutions have been instrumental in carrying forward the shared vision of ‘man-making and nation-building education of global standards’ of its Founder Chairman, Dr Stya Paul. Dr Stya Paul’s legacy of excellence is being carried forward by his only child, Mrs Sushma Paul Berlia. Sharing the five-decade-long journey of AES, Mrs Sushma Paul Berlia congratulated and thanked all members of the Apeejay Stya family and all those who have been associated with the Group, in the past or present, directly or indirectly, contributing in myriad ways towards the 50 years of the success story of the AES. Lord Swraj Paul gave an emotional tribute to his elder brother and Founder Chairman of AES by saying, “Dr. Stya Paul, was my mentor, father, brother and everything.” He applauded the remarkable achievements of the Apeejay Education Society. Lord Swraj Paul also appreciated the cultural delights of the evening presented by Apeejayites through dance, music and myriad display of talent, which he said were as good as those of professionals. Mr Nishant Berlia, General Secretary, Apeejay Education Society and Dr. Neha Berlia, Member Management Board, Apeejay Stya & Svran Group, graced the occasion as well.